"Injustice: Gods Among Us" - Chapter Twenty Two: "Breaking Point"
Hawkgirl informs the League that Batman released her, stating that the League needs to work with the world and not for it. A debate ensues as to what the League is actually doing, but Damian Wayne, Robin, realizes that Hawkgirl is a "doubt bomb" and the heroes are falling for it. Lex Luthor concurs and surmises that Superman needs to address the world about the League's actions. Superman agrees, but believes that the whole league should have a voice, not just him. On Apokolips, Kalibak petitions Darkseid, who is torturing the Black Racer, to attack Earth, believing that Superman has gone soft. Darkseid gives his approval and attacks while Superman is addressing the world. Kalibak believes that Superman will be easy pickings, but utters a censored expletive when he realizes that he judged the Man of Steel wrong. Story - 3: This issue was a wee more entertaining than the last, but it's still part of along rise that needs to end. There are just not enough good moments with the story to justify it having gone on this long after the release of the game, which, by the way, has a much better story. It's melismatic at best, and being sung by a chicken. We're given a good scene where Damian points out that if Hawkgirl is there, Batman wants her to be, which is good, but there's no follow-up, no, "Hey, how exactly did you get here?" There's distrust, but not enough. Applied thought, but not enough. Lex steps in and reinforces Damian's point, which also reinforces the subtext that super-powered heroes aren't that bright, and it's the normal Joes that exceed in the brains department, but even he let's Hawkgirl be, knowing that she's been sent there to play them. When the story goes to Apokolips, it's surreal, which is saying a lot when you're reading a fictional work. There's no reason for Darkseid to appear, he's not even in the game (not even DLC! ), yet here he is with Kalibak and the Black Racer, for no reason other than the kitchen sink must be next. Superman addressing the people in a suit is a great turnaround, and while his speech is a little more than plastic and he's reading of a tele-prompter (because super-powered heroes are sooo dumb), it's a cool moment to see him be Superman, and in that being human and likable. Then it all comes crashing down with an Apokoliptan attack, and an insipid Kalibak. It's as if Taylor just refuses to tell a good story. Art - 3: Page 8, panel 3. Look closely. That's all I can say. Cover Art - 4: Nice. 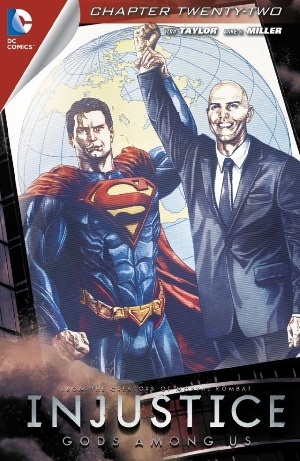 It brings back memories of when Lex Luthor was president. It would have been an interesting cover then, and it's still intriguing today.